Does it happen on any page? Opera doesn't show such icons, maybe they are from an extension? Welcome to Opera's forums @Arturvsthefoe! 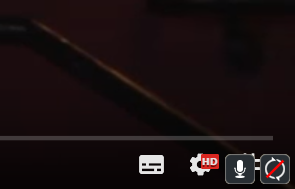 Never seen those icons but, did you enabled Camera and Mic for those sites you use in FullScreen? It happens on Youtube? Or any other site limited to watch? Are you installed any extension recently? You may try with a Private window Ctrl+Shift+N or a clean profile or download this and test as a clean profile. I've tried disabling every extention and going Private Mode. I didn't change any mic related setting. I noticed it shows up on youtube, kimcartoon and opera's own fullscreen (F11). It only shows up in Opera and Vivaldi.